OAKLAND, Calif. — With most of their contracts expiring at midnight April 4, AT&T landline workers have been holding informational pickets around the country to emphasize they are serious about the strike authorization they passed by an 88 percent majority late last month. Over 75 AT&T workers and their supporters gathered outside AT&T headquarters in downtown Oakland April 2. 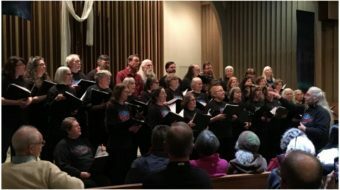 They marched with signs that said “CWA on (just practicing) against AT&T” and “$12.8 billion profit = fair contract,” as a percussion team kept up a lively beat on drums improvised from the surroundings. Health care is the top issue in the talks, said CWA Local 9415 President Sally Venable. She said the company is demanding that workers for the first time assume part of the cost of family health care. “For years, we’ve accepted lower wage increases in order to keep our benefits,” she said. The executive board of the Communications Workers of America, which represents some 125,000 workers covered by six contracts, has approved strike action if agreements cannot be reached with AT&T East, Midwest, Southwest, West and the nationwide Legacy unit. A sixth contract, with AT&T Southeast, expires in early August but talks are going on now. Hill said the company, which posted nearly $13 billion in profits last year, should be a leader in helping turn the economy around and in providing good middle class jobs, not cutting jobs and benefits. In Kansas City, Mo., members of three CWA locals braved rain and wind to hold a lunchtime picket April 2 at company headquarters. Colleen Downing, president of CWA Local 6450, told the Kansas City Star that the company’s proposals involved concessions in most areas, including wages, health benefits and work rules. 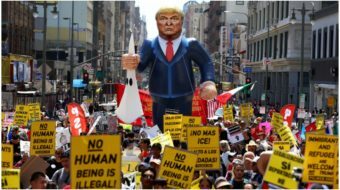 Workers also picketed and rallied in Pittsburgh, Dallas, the Rio Grande Valley, Kalamazoo, Michigan, several Connecticut cities, and many other locations around the country. 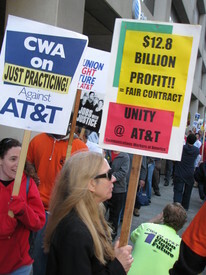 While some industry analysts asserted that AT&T would come out on top in a strike, others warned that the company’s proposal to shift managers from the wireless side over to the landline program could result in big problems for the wireless side, and union and non-union workers there could be reluctant to cross picket lines.